There's no better way to understand trees than to climb high and study them firsthand. This practice isn't without danger, however, particularly if you're scaling the trunk alone. To be fully prepared in case of an emergency, here are a few tools that should always be in your pack as an arborist. You're already wearing one, but what if it fails? Have a back-up just in case. Make sure all your belts meet the criteria of the American National Standards Institute (ANSI) and come with a sliding d-ring for flexible mobility. 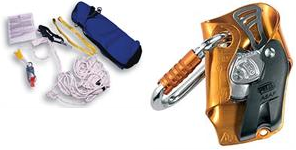 Stop a slide or dangerous descent with the belay system offered by a fall arrester. You control the slack and the safety lines; just tug on the ropes manually to move around the tree without worrying about breaking your neck. These simple tools become lifesavers if you're ever injured or stranded after your landing branch breaks. Many climbers shun them because they have a lofty opinion of their own skills, but this gear should be a part of everyone's self-rescue kit. Spare yourself the embarrassment of getting stuck in a tree by rolling up a rope ladder and storing it in your pack for desperate times. The right kind of ladder won't hog a lot of room, but it may save you a lot of trouble one day. These are just a few must-haves in arborist safety gear. Good luck, and happy climbing!